​Annually, Neuer Berliner Kunstverein commissions contemporary artists to realize an exterior project on the façade of its building on Chausseestrasse, and thus to change the view of the urban space. Working in the public space is deeply rooted in the practice of Alfredo Jaar, who since the beginning of his career has attracted attention with politically motivated actions. His series of graphic diagrams titled Rosa, Karl, Bertolt, Herbert and the others (2017) and designed for the n.b.k. 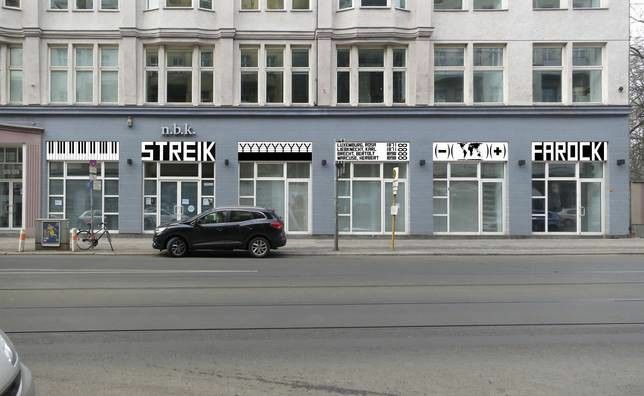 is an homage to Harun Farocki and his critical view on social conditions, and at the same time addresses the varied history of Chausseestrasse.